This garden is especially for Mediterranean plants, but inlcudes a collection of tropical plants. This allows for year-round visiting, since Mediterranean plants flower usually in late winter. The garden was created in 1983, and opened to the public in 1991. Location: At the west side of Nice, near Sainte-Marguerite; north of the Airport. A nice park on a small hill, with the pillared Temple de Diane at the top, and a view south to the city center. 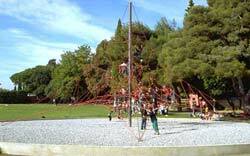 The park has big trees, lawns and benches at different levels, and a fenced playground for small children. Location: North, at the top end of Ave. Borriglione, between Ave. George Sand and Ave Chateaubriand. 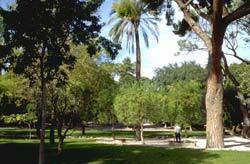 This lovely big park has large areas for relaxing and picnicking (the photo above left shows a painter). At the very top, a lookout area has a fantastic view of Nice and the coastline, and there's a terrace café and souvenir stand. A waterfall, just below the top is visible from the town below, and a walkway at the base of the falls provides a refreshing mist-shower in the summertime. A big playground includes a jungle-gym rope web (photo above right) that's a favorite with the kiddies. Location: Colline de Chateau, the high rock between the old town and the port. Cimiez Amphitheater Park. A lovely big grassy park amidst centuries-old olive groves. No playground, but the lawns and trees and low stone walls are a good place to let the kids loose while you sit and relax or picnic or nap in the sunshine. Location: The park is on the Cimiez hill, 2 km north of the center (also the site of the Archeology museum, Matisse museum and Franciscan Monastery. his is a lovely area of gardens and pergolas, beautiful flowers, fruit trees and a dense little wooded area. It's popular, but has quiet sections and is peaceful as well as beautiful. In addition to the flora, we especially like the ancient sundial (cadran solaire) on the end of the monastery facing the gardens. Location: At the Franciscan Monastery, behind the Cimiez Amphitheater Park on the Cimiez hill. This is a very nice floral park, with water, lawns, thousands of flowers, an aviary and exotic butterflies. Most of the park is in the open, but the huge "green diamond" is the largest greenhouse in Europe, with different tropical climates, tropical forests and plants, birds and free-flying butterflies. The butterflies are stocked mid-April, so an off-season visit would miss them.